The attic is almost done! The attic is almost done! We’ve spent the Easter weekend painting the attic walls and ceiling in Flutterby clay paint by Earthborn. It’s delightful stuff: goes on easily and dries super-fast and looks gorgeous. 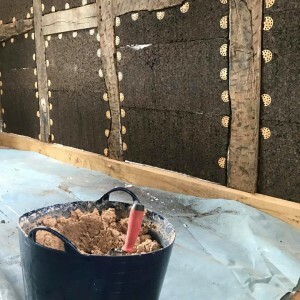 Putting it on with a roller, it retains most of the lime plaster texture. 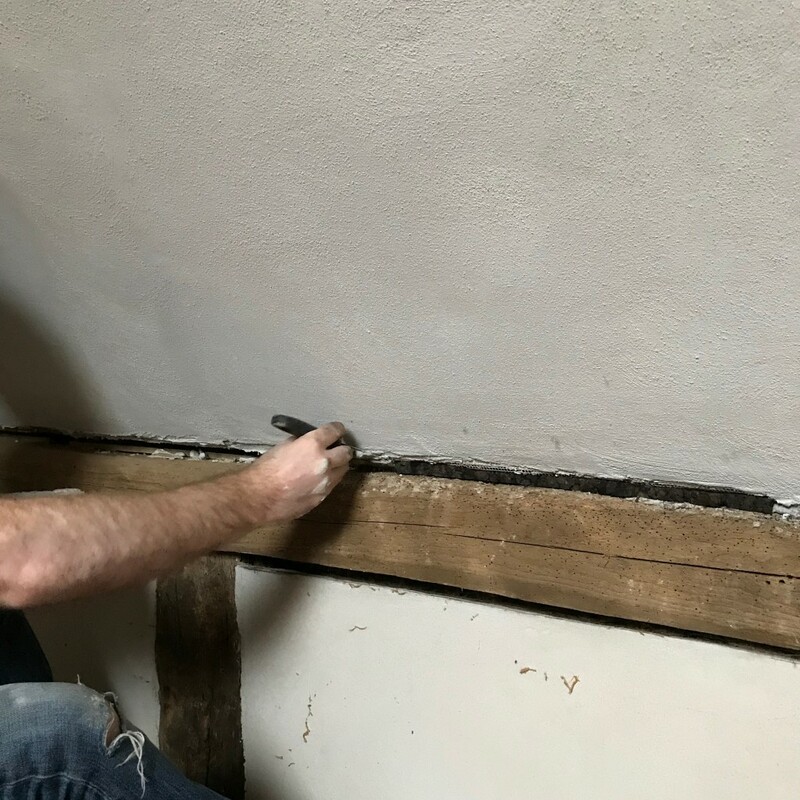 Then we oiled all the exposed timber with Osmo Polyx Oil – same as we used for the floor. 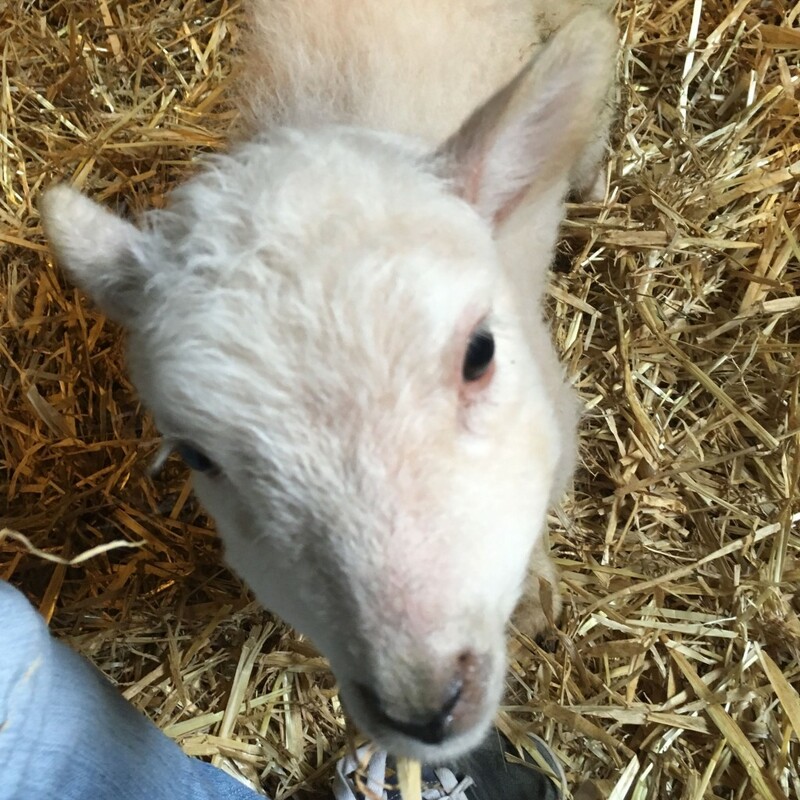 We still have to put skirting board up – but we’re getting Ken to come and take a look. He’s making us a door, too. And we’re getting some architectural glass to fit over the frame at the end. But other than that… we’re almost done. We’d have been moving into the bedroom tomorrow if we’d read an email properly. The bed-frame we have now is gorgeous, so we’re moving it up to the attic. But the mattress is pretty aged, so we bought a new one from Emma – it was 35% off and is rated as the UK’s best mattress, so we’re pretty chuffed with that. Paid extra for fast Saturday delivery, thinking it’d arrive Easter Saturday… only on checking the email, it said delivery for Saturday 27, which is too late. So I’m waiting for them to call me and rearrange delivery and give me my extra delivery cash back. 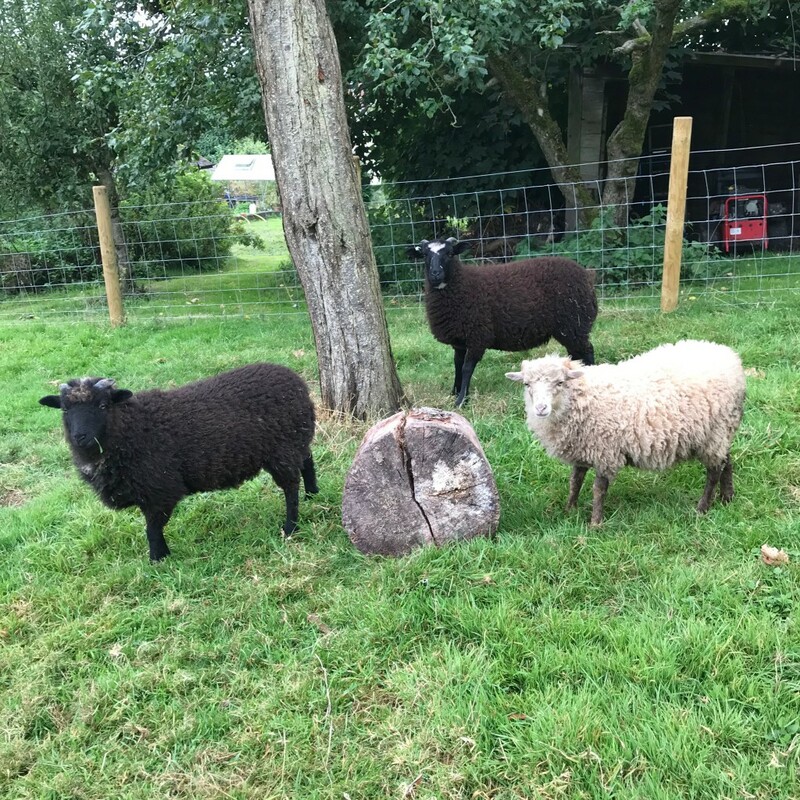 We’re so excited because we also have brand new duvet and pillows made from Merino wool, and gorgeous new bed linen from Cologne & Cotton. And we have a chair, which I’m going to reupholster in some amazing fabric. Tomorrow, I shall start making the attic cosy. 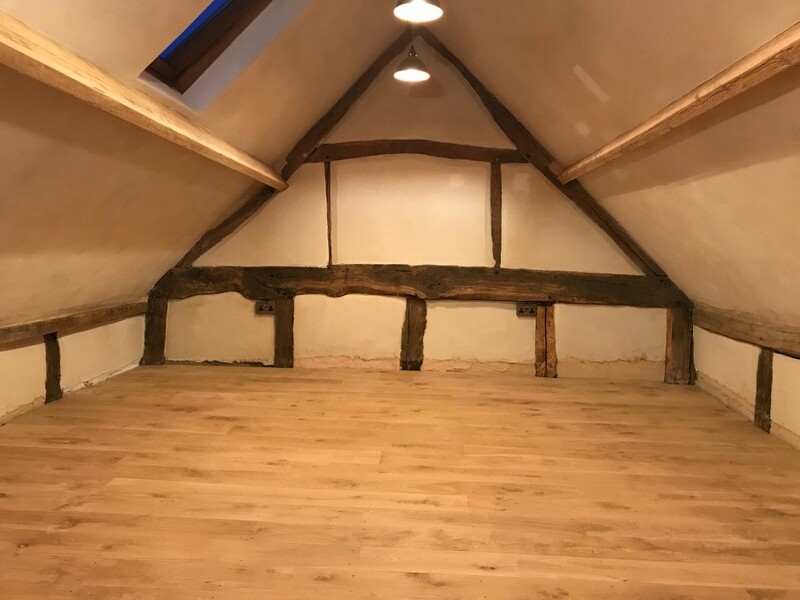 After almost exactly three years in The Dingle, the attic has a proper solid oak floor–and we’re bloomin’ delighted! 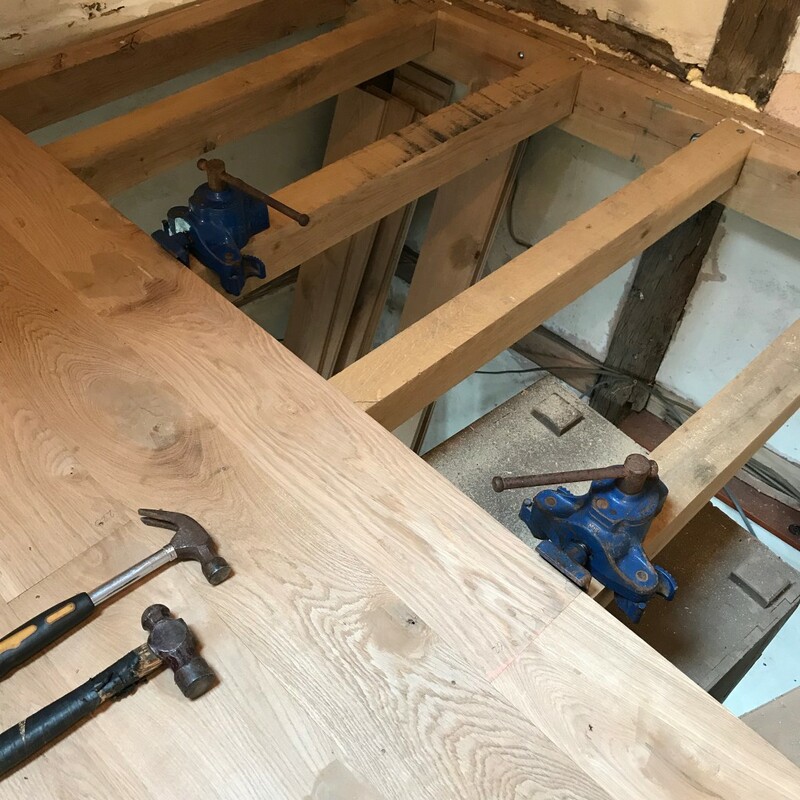 Having asked grownups to do the scary structural stuff like the big oak beams and joists, and the staircase and roof structure, we thought we’d have a go at laying the floor ourselves. There were loads of options, but we decided on character-grade solid oak planks with tongue-and-groove edges. And they’ll be even more beautiful at the end of this weekend, when we’ve oiled them. 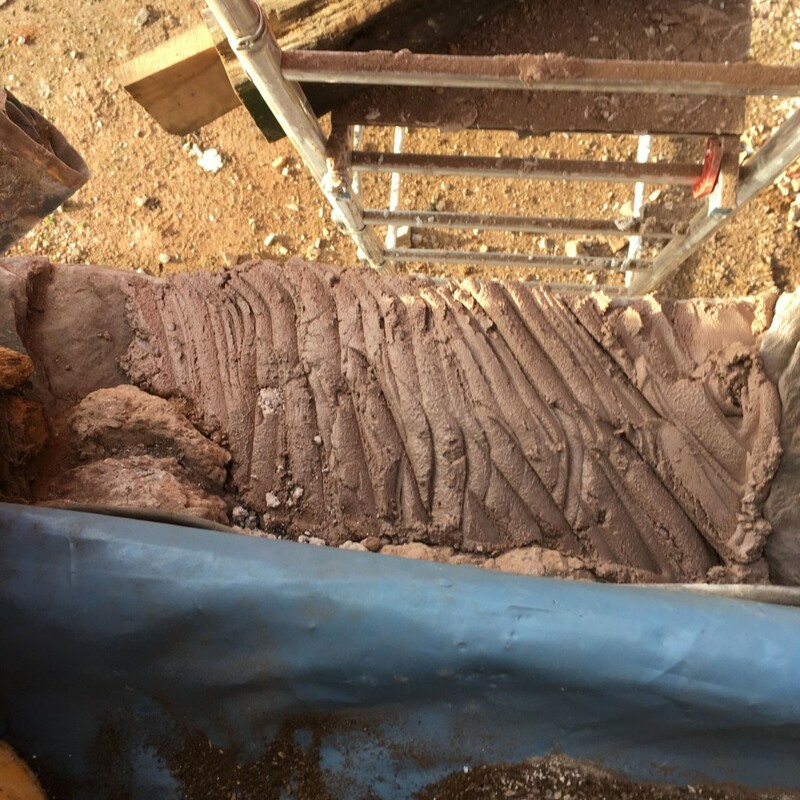 Then we had to jigsaw notches around the structure, which went rather well. Those strips are 3mm MDF. We used it to fill any gaps between board and joist, so hopefully there won’t be too many squeaks and creaks. 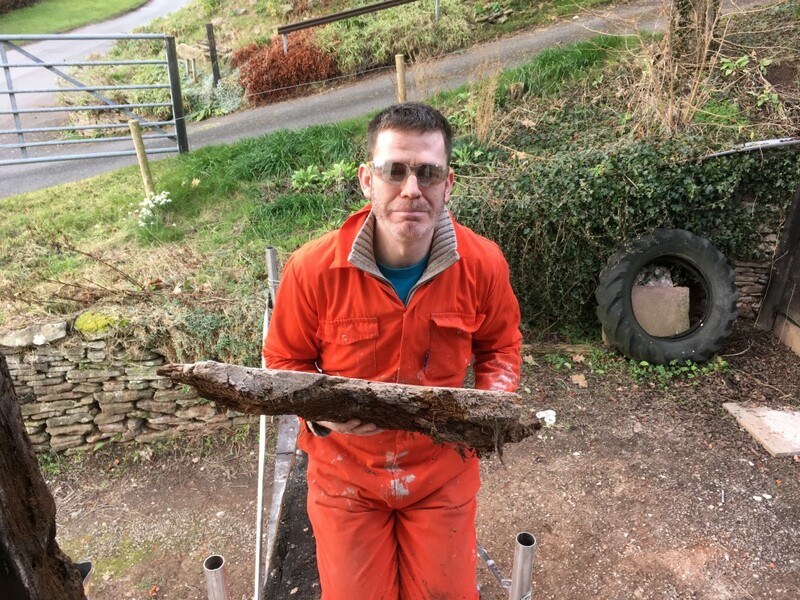 Most of the planks fit perfectly, but the odd one or two weren’t quite perfect – so Joe got a chisel out and did a brilliant job of fettling. Under close supervision by Whiskey, of course. And suddenly we were motoring. Slowly, like the first automobiles. But motoring nonetheless. Now, a cautionary tale. 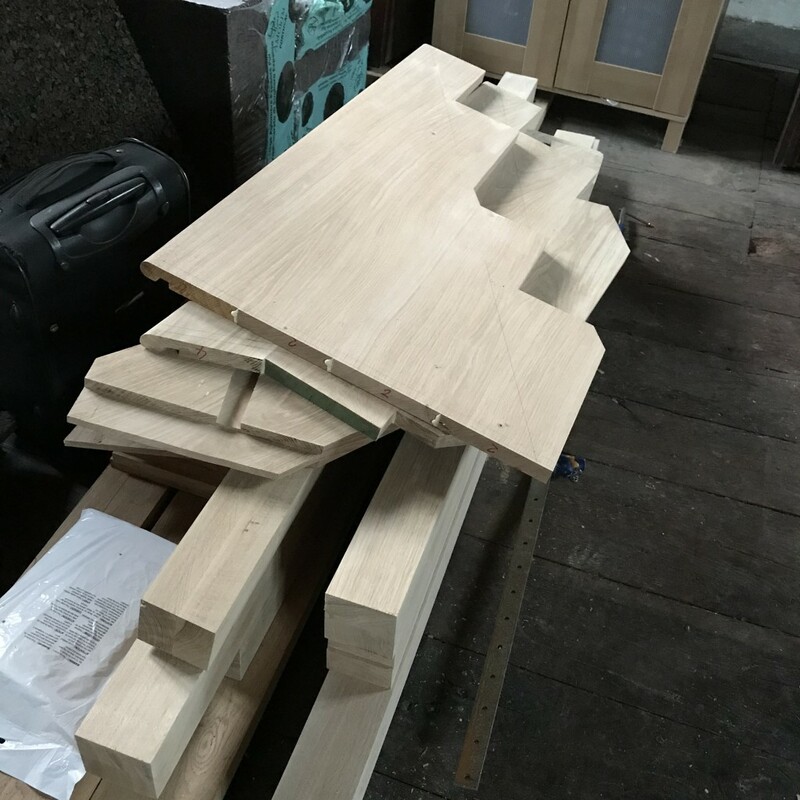 While laying this floor, we learned Important And Useful Things that may help you, should you ever decide to lay a solid wood floor. Are you paying attention, grasshopper? Thing The First: Flooring. Takes. AGES. 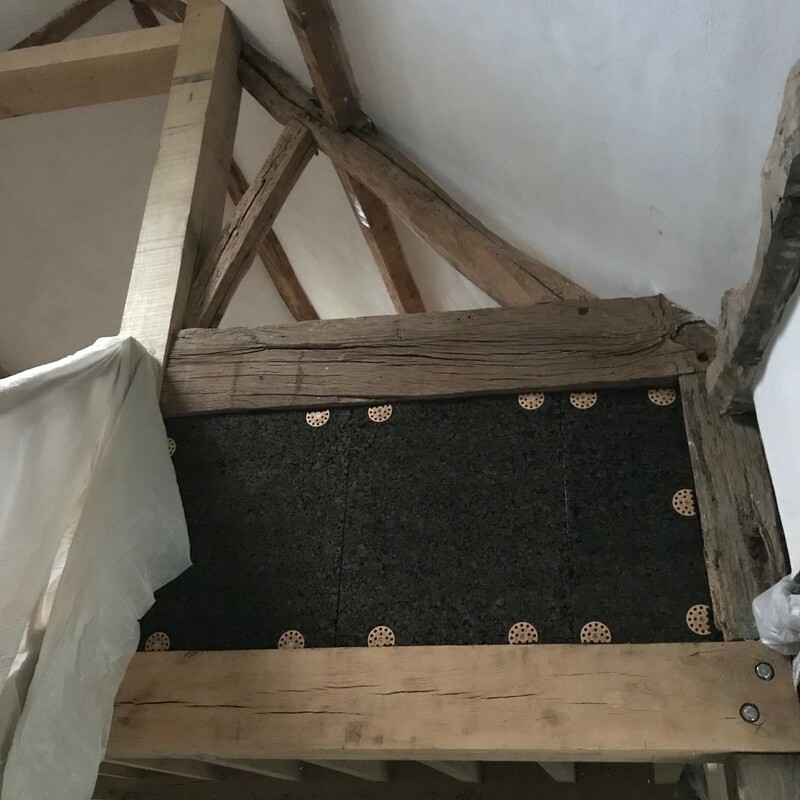 We thought we’d spend ages fiddling the first row into place and ages fiddling the last row down (because the end of the attic isn’t so much a rectangle side as an oval). Then we believed we’d turn into an efficient floor-board-laying machine. 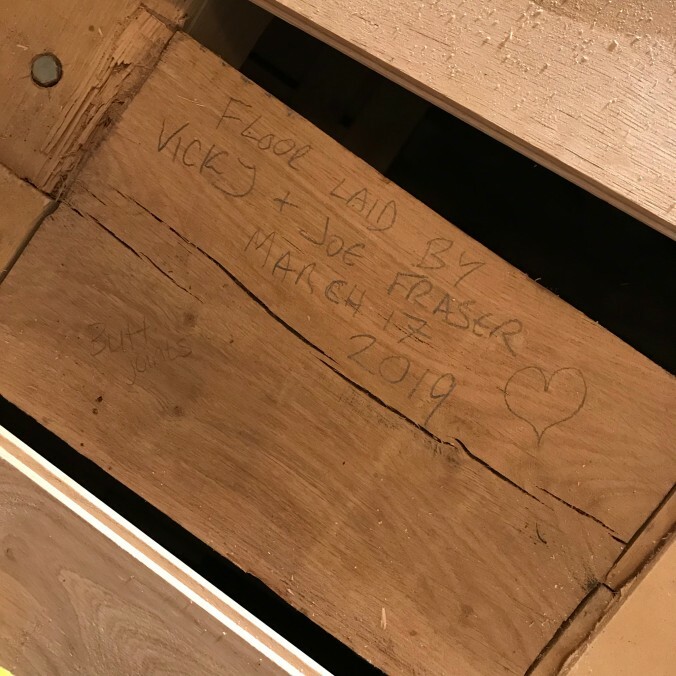 Oh how we laugh now… because laying floorboards takes bloody ages. Especially when you don’t have clamps (see further down). But it was good fun and we did learn a lot of useful stuff. I’m sure professional flooring people do this at lightning speed, like those sped-up videos on t’internet. But we did not. 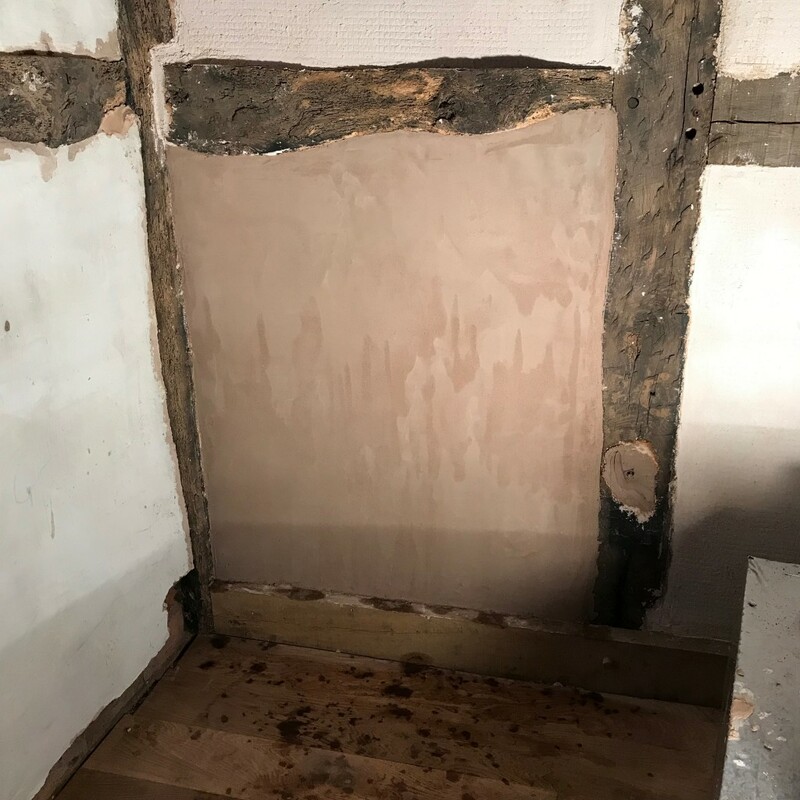 I have no idea if joist spacing is standardised, but just in case: make note of how far apart your joists are when you’re ordering your planks. It will make it easier to lay them and make for less wastage if you have different lengths that’ll fit nicely in the gaps. When laying a row of planks, you want the join over the joist for strength. The whole thing is like a jigsaw puzzle. Or picture on the box. About halfway through laying the attic floor, we had a brainwave. Up until that point, we’d been measuring joists and then going downstairs and measuring loads of planks to find one that fits. You’re probably reading this and wondering how we manage to dress ourselves – I bet you’d have labelled all the planks at the start, right? Well, it took us a couple of days but we got there eventually. We measured each plank and wrote the length on each in chalk. Made it much easier to plan. Just in case this doesn’t occur to you, take our word for it: labelling in advance will make the job much quicker and much less annoying. 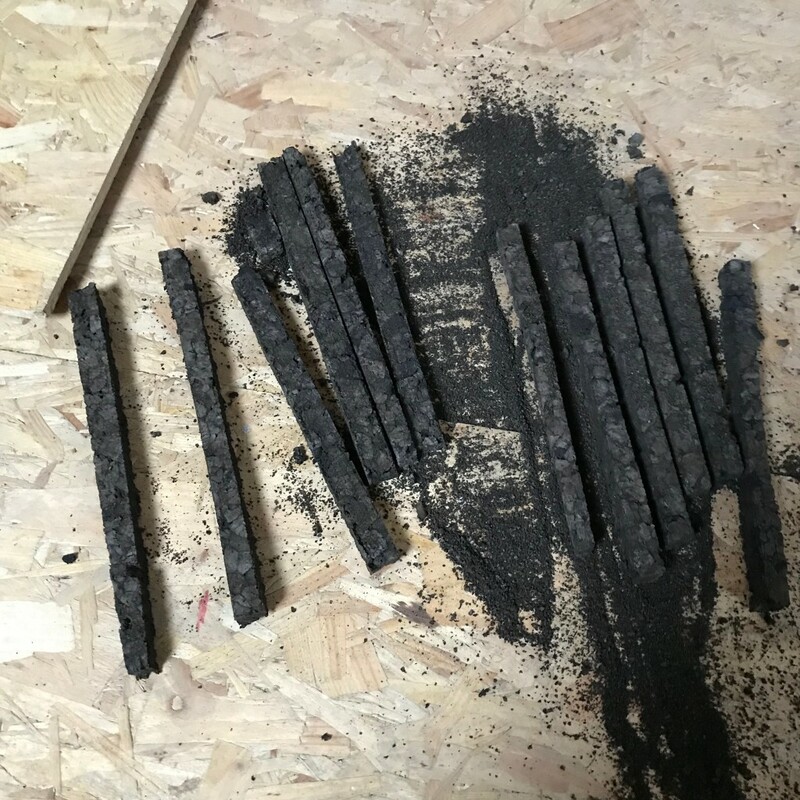 While you’re labelling your planks with the lengths, write all the lengths down in a notebook so you can cross them off as you use them. That way you don’t have to go downstairs every time you want to plan a row. You can just check your notebook. Easy peasy. 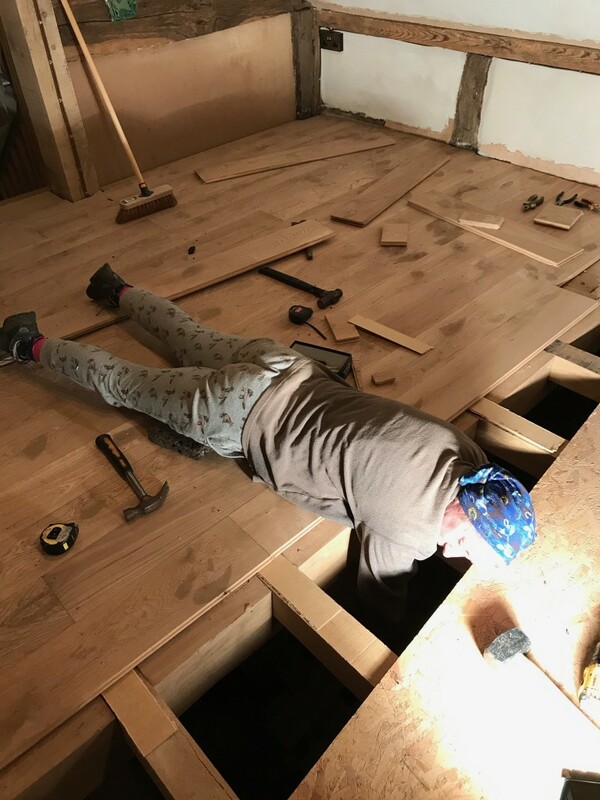 About halfway through our flooring adventure, one of Joe’s BJJ buddies – Pat (thank you dude!) 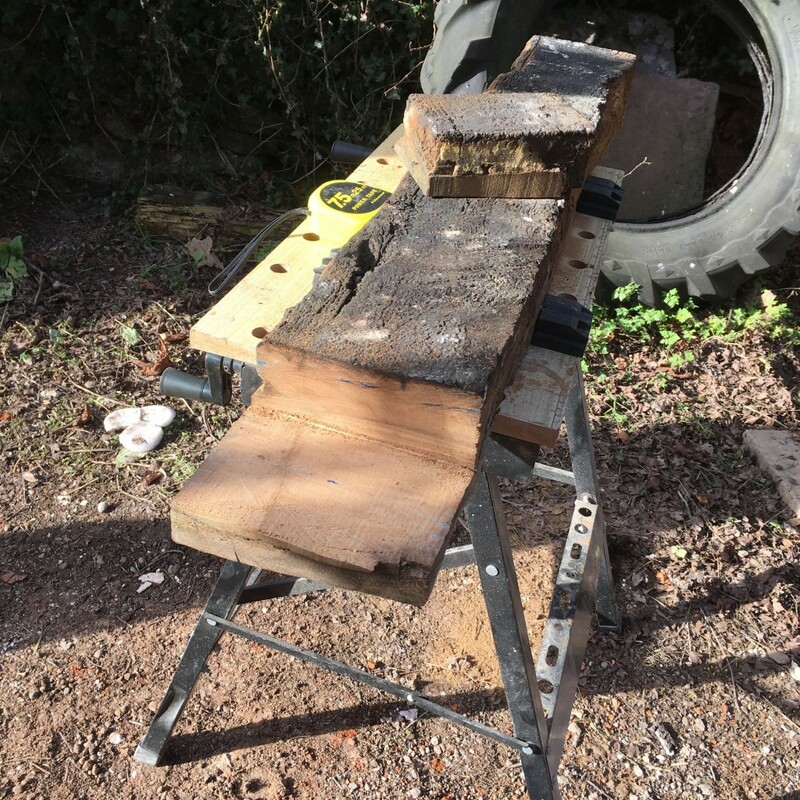 who is a black-belt strangler – saw our Facebook post about our progress and asked if we had floorboard clamps. Until then, we’d been using our feet. 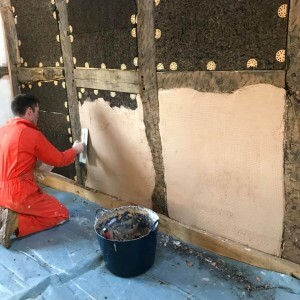 As in, I’d perch on a joist and shove my feet against the board we were nailing down and put as much pressure on as possible to close the gap while Joe banged nails in. 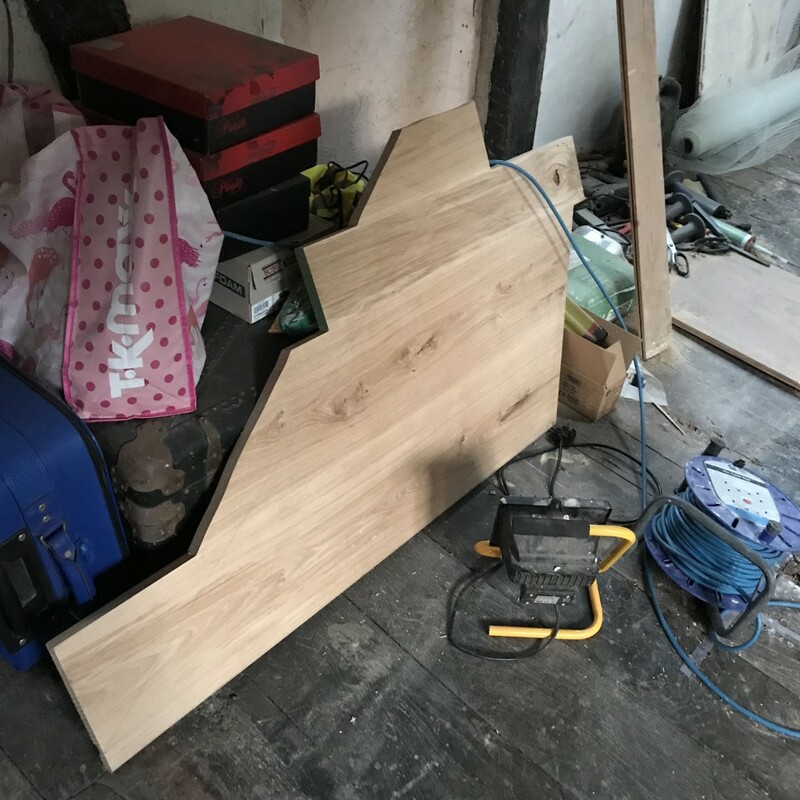 It worked, after a fashion… but you can definitely tell at what point the floorboard clamps arrived because the gaps entirely disappear. We’re okay with that, because our learning curve is part of the history of the house now. It’s cool. You might be wondering why we didn’t use secret nails. The reason is because the wise owl at Good Bros Timber who sold us the oak floorboards advised us to use lost-head nails. So we did as we were told. Also, it fits with the rest of the house. For about half the floor laying adventure, we punched the nails in as we went along, using a big ‘ammer and a nail punch. One of which broke. Nothing to do with me being ham-fisted. This is a right pain in the bum because the punch is always at the wrong end of the room. Incidentally, bonus tip: have a little wheely trolley and put all your tools in it and wheel it around as you work. Or, alternatively, every time you stand up, pick up your hammer, nails, and anything else and take it with you or you’ll spend all your time swearing and asking where your hammer is now. 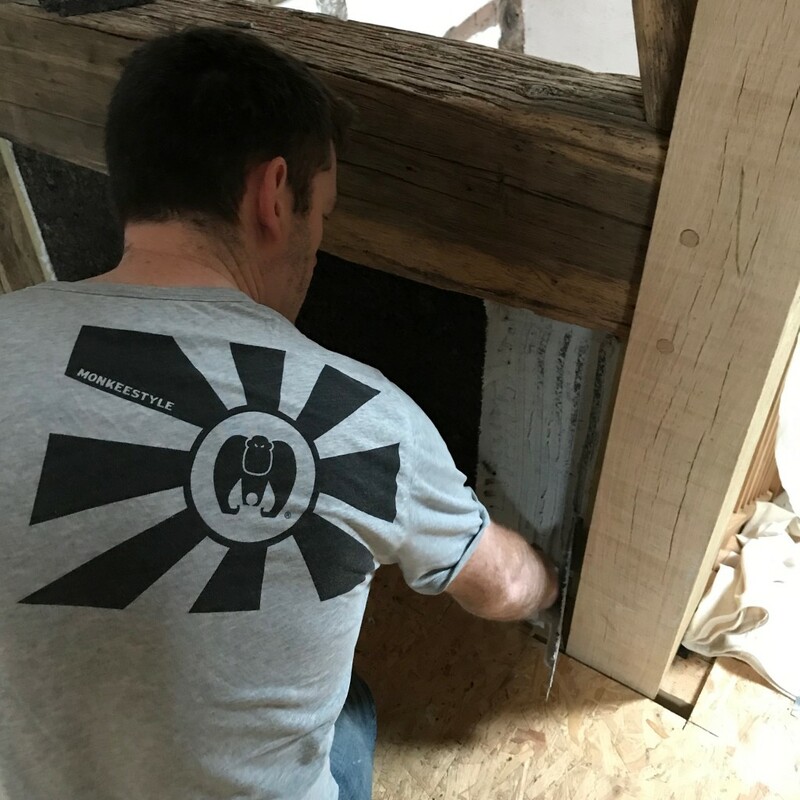 Back to punching: knock all your nails in, then at the end when all your boards are down, you can work your way methodically along each joist punching the nails. It’s much easier than staggering around the floor doing it as you go along. Do not underestimate how much hard work this is if you don’t do a lot of this type of thing. It was surprisingly hard work. We fell asleep on the sofa about an hour after showering and dinner after each flooring session. Working tired means you miss more nails (there are some little dents in the boards), you forget to stick nails in (we found an entire board without any nails at all: winning! ), you bend more nails with inaccurate strikes (which is really irritating because getting them out is bloody difficult), and you risk hurting yourself. 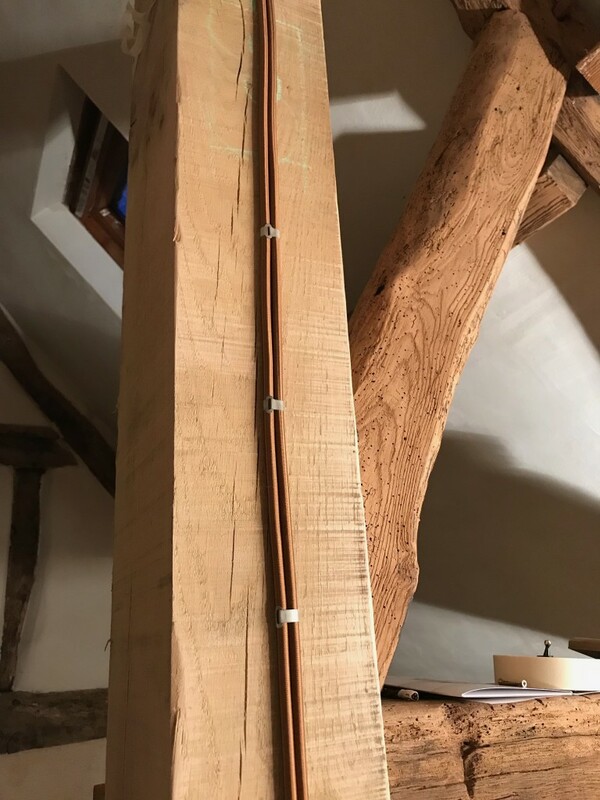 As soon as you miss the first nail or put a slight bend in one, it’s time to take a break at the least, or pack up for the day if you’re knackered. Trust us: pushing on through is not worth it. At the far end of the room, the wall is seriously bowed. Like an egg. 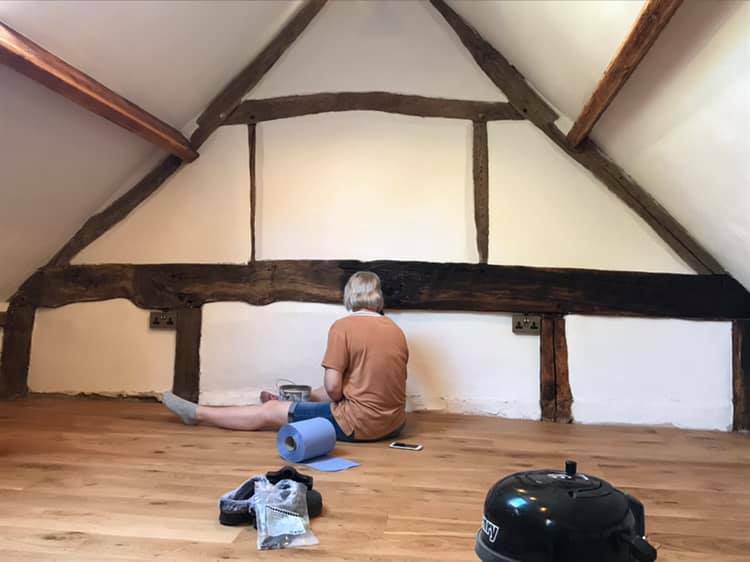 And while I was away for a day, Joe did a stunning job of jigsawing oak boards to fit precisely into that funny shape. It’s perfect. Here’s the finished floor. Didn’t we do well? Next week: sanding and oiling (it looks gorgeous). In the beginning was the wiring. And the wiring let us add light. In the attic. 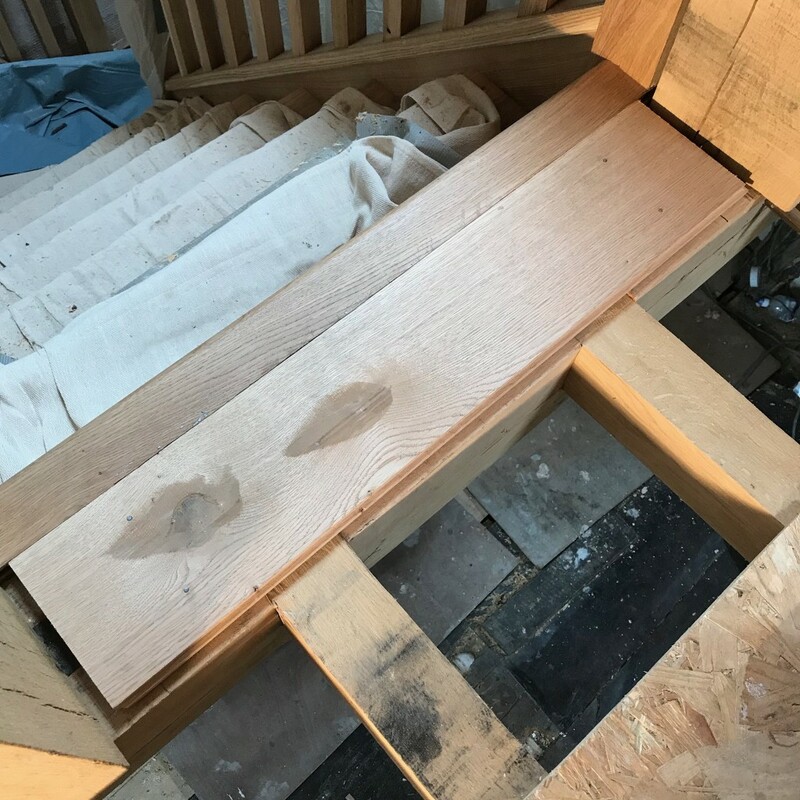 We didn’t want to butcher the original oak ridge beam by planing a flat surface onto it, so we pondered our options. 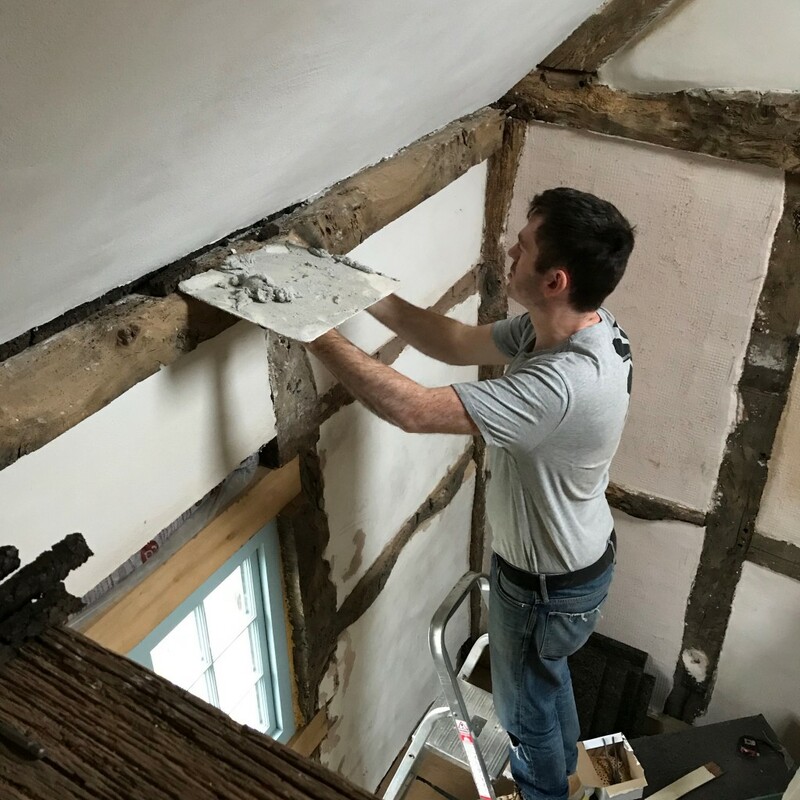 In the end, we bought round oak pattresses, drilled them so we could run wires through them, and fitted them to the sloping ceiling. 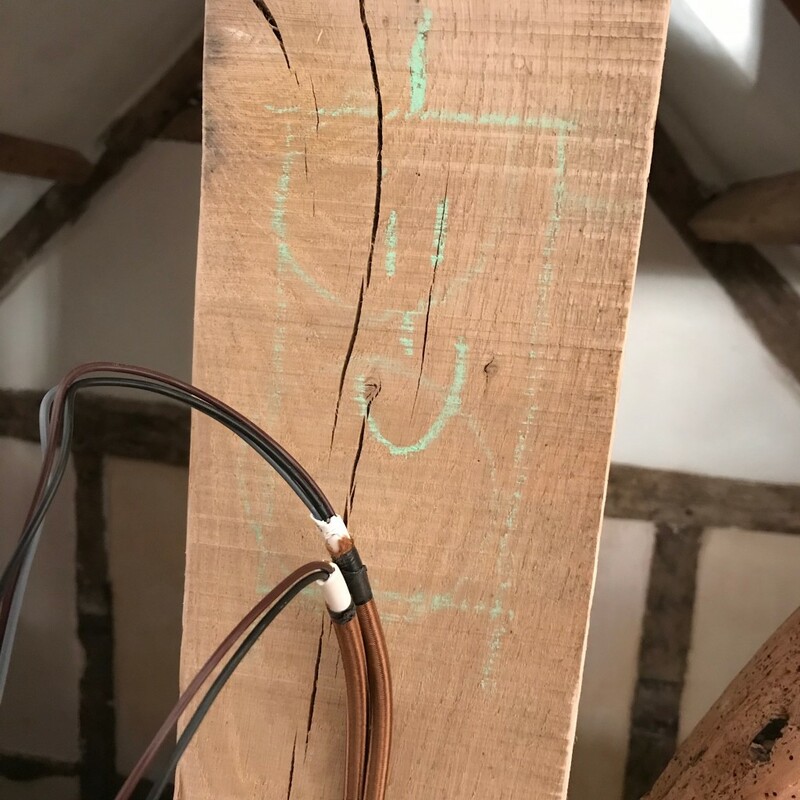 We wired along the ridge beam using the lovely flex. It looks fab; you can barely see the wires unless you look, then when you do look, they’re beautiful. 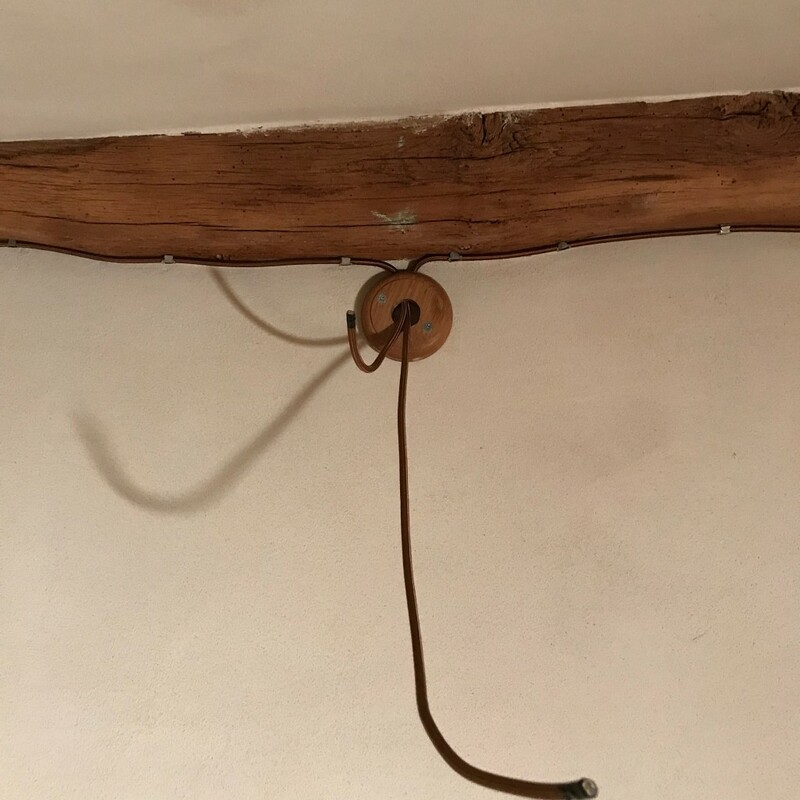 Once we had the pattresses up, we fitted the pendants and hung them centrally from the ridge beam using hooks from More Handles. 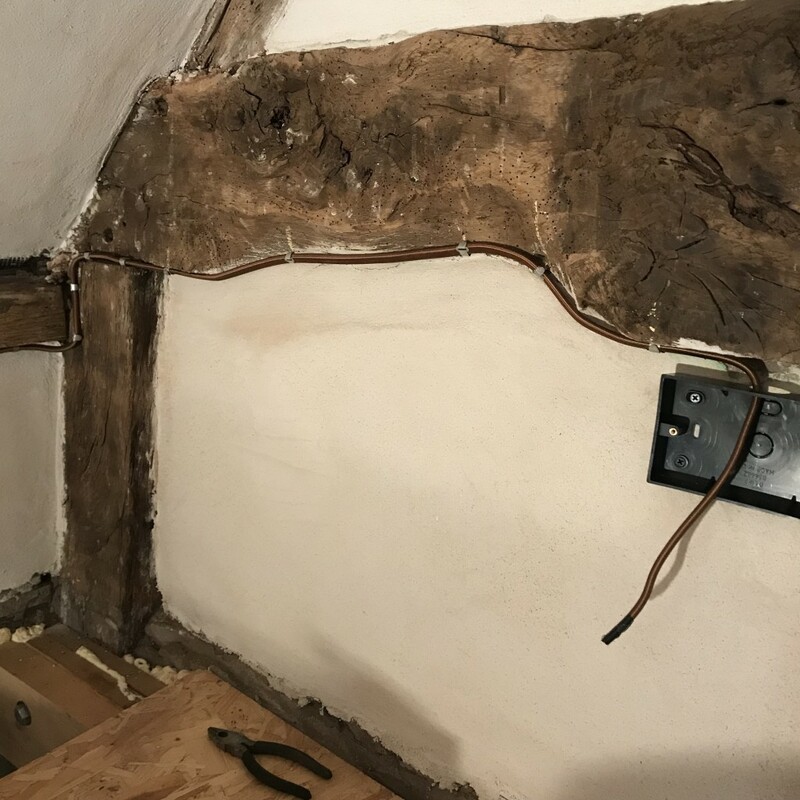 Ancient houses bring interesting challenges, such as: how to deal with the wiring. With a newer building, you just chase the wires into the wall and plaster over them, job done. 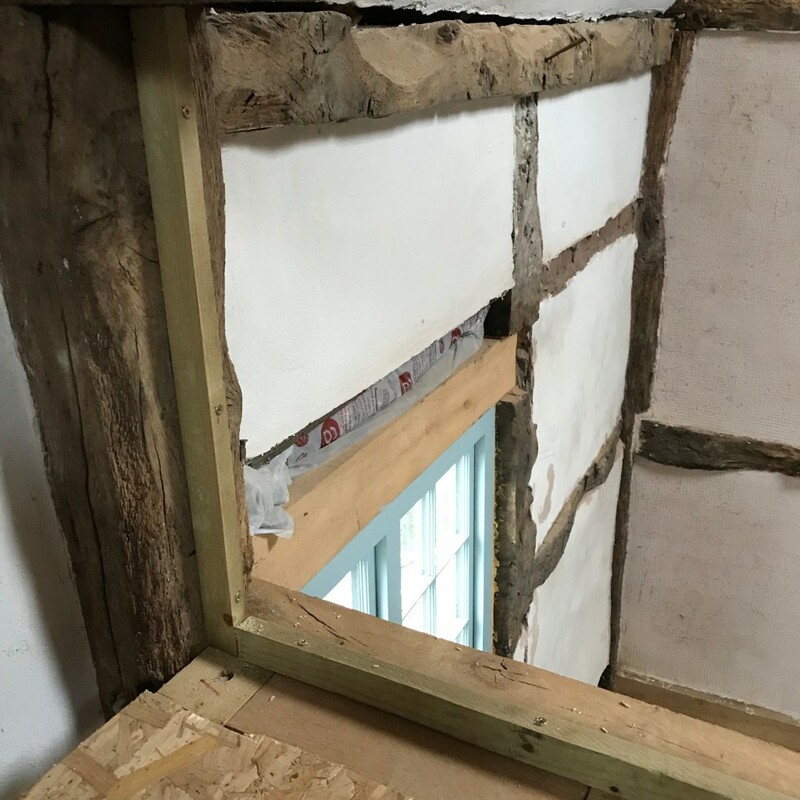 In an ancient structure, with exposed timbers and lath and plaster, and newer cork panels, and strong oak joists, it’s not that simple. 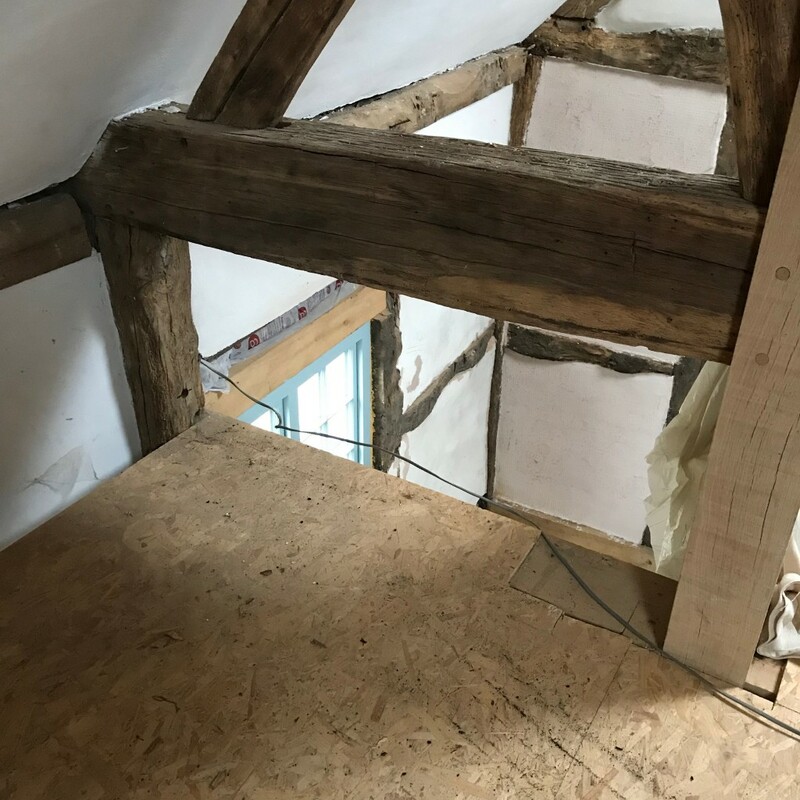 You can’t wire through oak joists because they’re smaller than softwood ones, so there’s a risk of banging a nail into a live wire. Not a big risk, but the regs don’t like it. And you don’t want to go chasing wires into walls when there are timbers in the way. 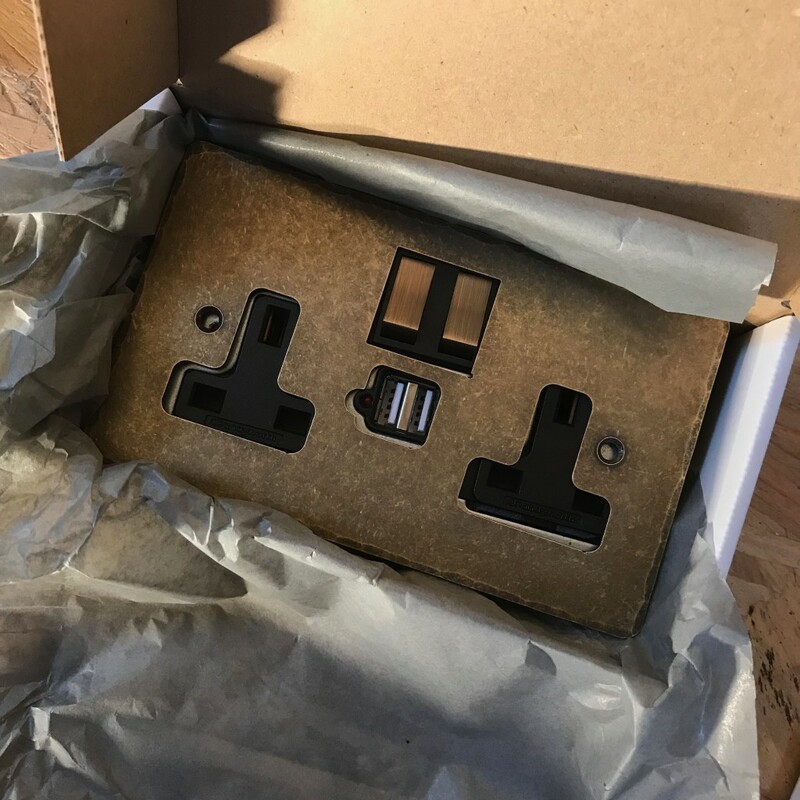 You find the World’s Most Expensive Cable and the World’s Most Expensive Sockets and Switches, and you crack on. We started with chalk and marked out where we wanted the sockets, switches, and saddle clips for the cables. Don’t want any (more) expensive mistakes. Deciding where to put sockets. We didn’t put the sockets on the timber in the end, we put them on the plaster in the corner to the left of that X. We made sure the saddle clips were spaced at regular distances (except when we had to wire around bends). This was exactly as fiddly and annoying as it looks like it was. I mangled many innocent tacks. I now have a new respect for conservation sparkies. I’ve never done anything so fiddly in my life. There was much swearing and gnashing of teeth – but we’re delighted with the results. Here’s what we did. 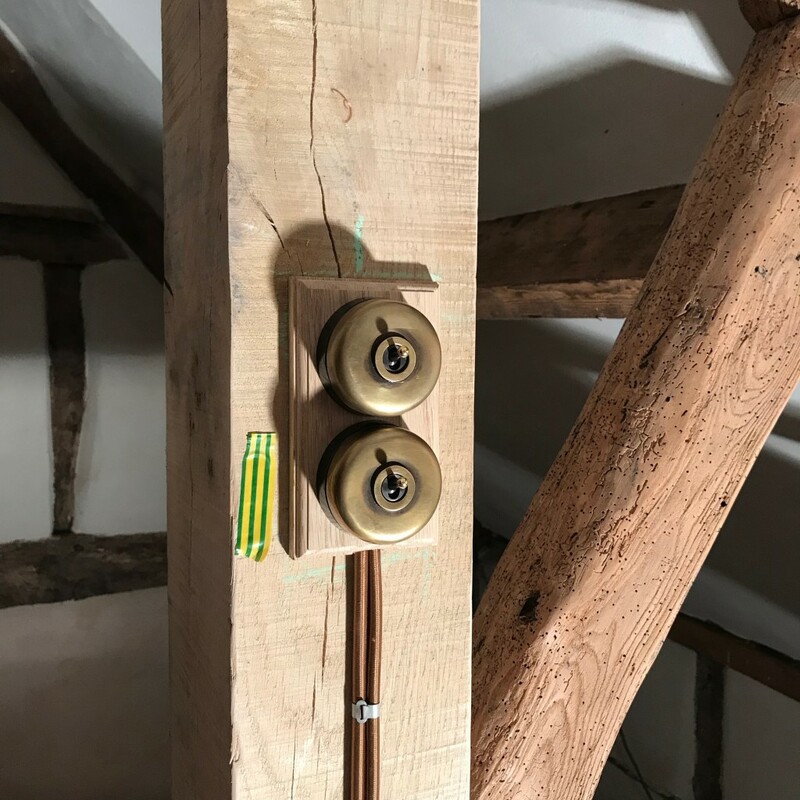 We took the 2.5 twin-and-earth wire (beautifully braided in old gold and a special order from the fabulous chaps at Flexform) from the junction box, into and out of four sockets, through the panel, and along the front of the mezzanine. When we’ve finished plastering, we’ll take pics. It’s actually pretty neat and tidy and it looks fab. 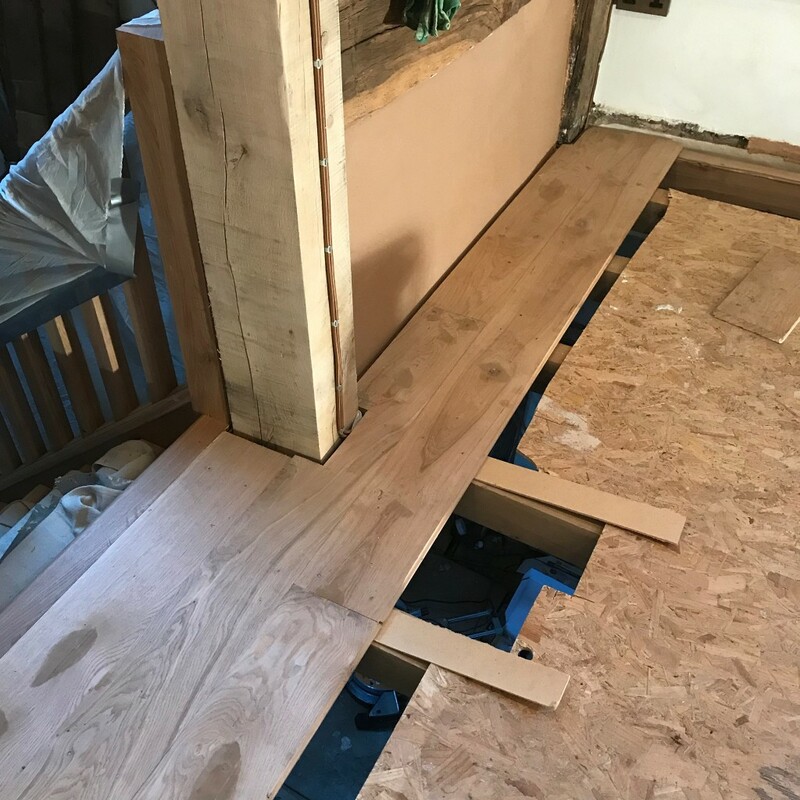 However, it was not as easy as it sounds: there are no straight lines in this house, so we followed the lines of the timber. It’s a work of art and it took hours. Which, of course, we do. So I’m going to replace them one by one, when Joe isn’t looking. One of the sockets has turned out to have a faulty switch, but the woman at Jim Lawrence couldn’t have been more helpful. They’re sending a replacement next week. The others work perfectly. 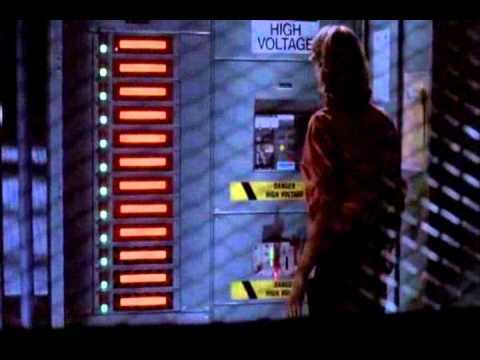 When we turned on the ring main, with Joe working his way along the fusebox switch by switch, it was just like that scene out of Jurassic Park. Not even kidding. Scenes from The Dingle earlier today. 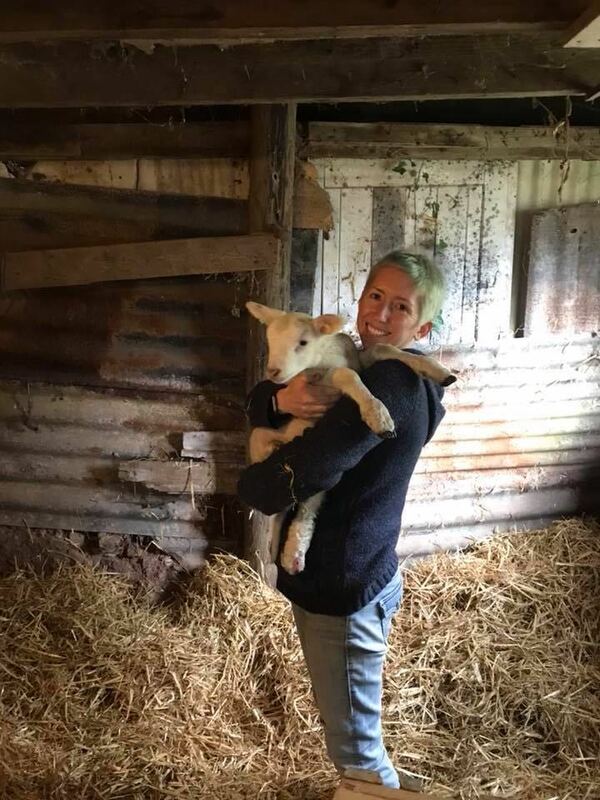 Mum and dad came over for the day and brought soup and an extra pair of hands. Joe and Dad and I got cracking on the lighting circuit. 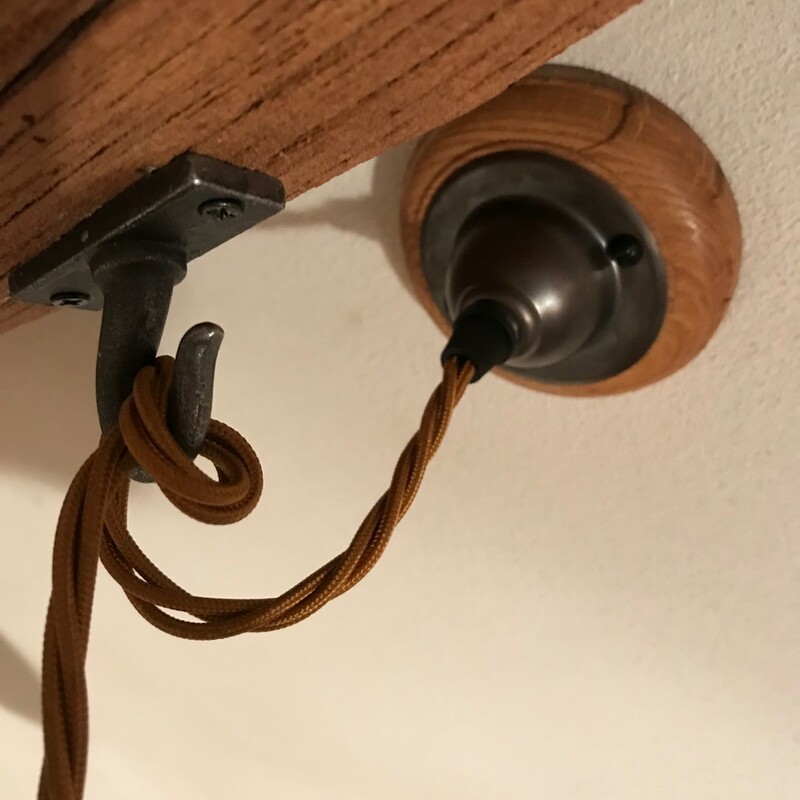 We’re putting three pendant lamps in the attic bedroom and one pendant lamp in the double-height hallway above the stairs. There will be two switches in the bedroom – one for the bedroom lights and one for the hallway light – and one switch on the first floor, for the hallway light. Normal lighting wire for moving volts around is three-core (two plus earth) 0.75mm. Wire to the switches is four-core (three plus earth). That earth tape is to mark which switch is which. The bottom switch – the one marked with the tape – works the attic bedroom lights. The top switch works the hallway light. The great thing about this is, I knew nothing about electrics before we started this. In fact, I feared the electrical world. Joe understands electrics, because he has his 17th Edition. I now understand how to wire a ring main, how to wire a lighting circuit, how to wire sockets and switches and lamps. In fact, I’ve done all these things in the last three weeks. That’s pretty damn cool. 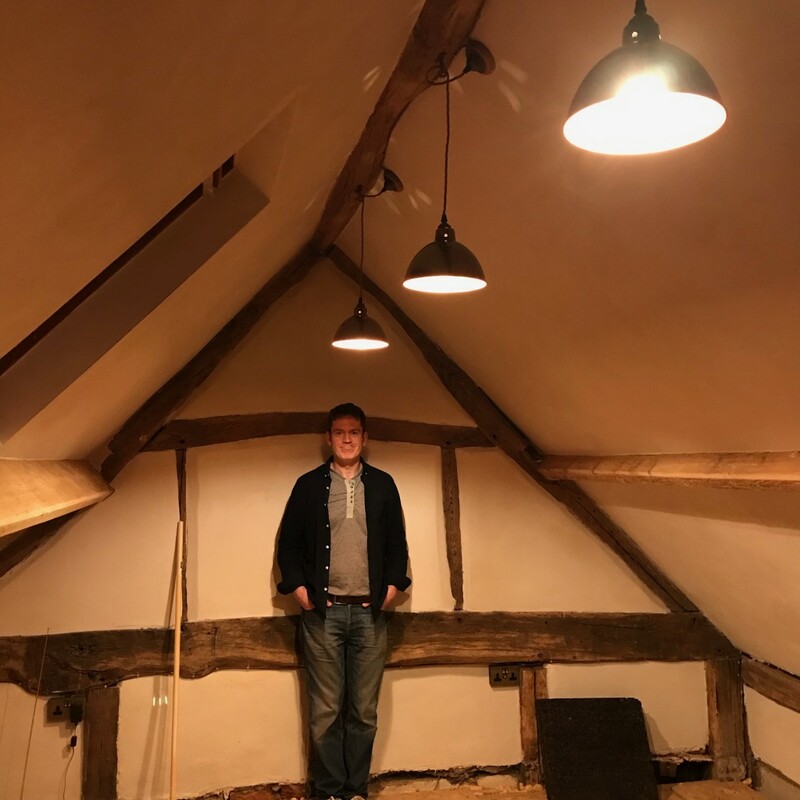 So, somewhat predictably, we weren’t in the new attic bedroom by Christmas. 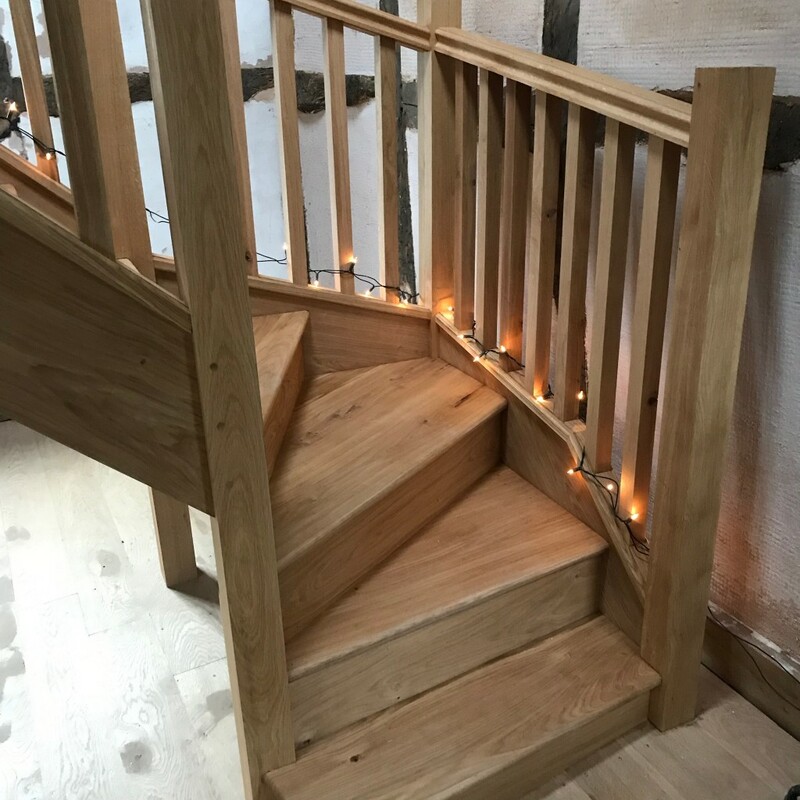 But our new stairs are up and they look magnificent. We’re completely delighted with them – not least because they came in £3,000 under budget. Which should give you some idea of how extravagant they were. 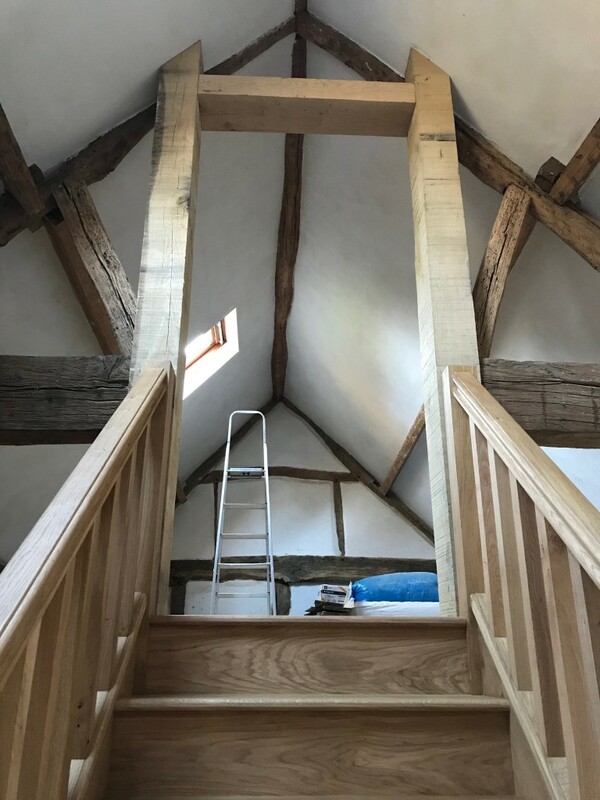 But we wanted solid oak, we wanted them to look beautiful and feel beautiful, and that doesn’t come cheap. Nor would we want it cheap. Still, three grand lighter is a result! We’re really pleased with the new floor, too. We gave the stairs two coats of Osmo oil to protect them, and they’re just about done. 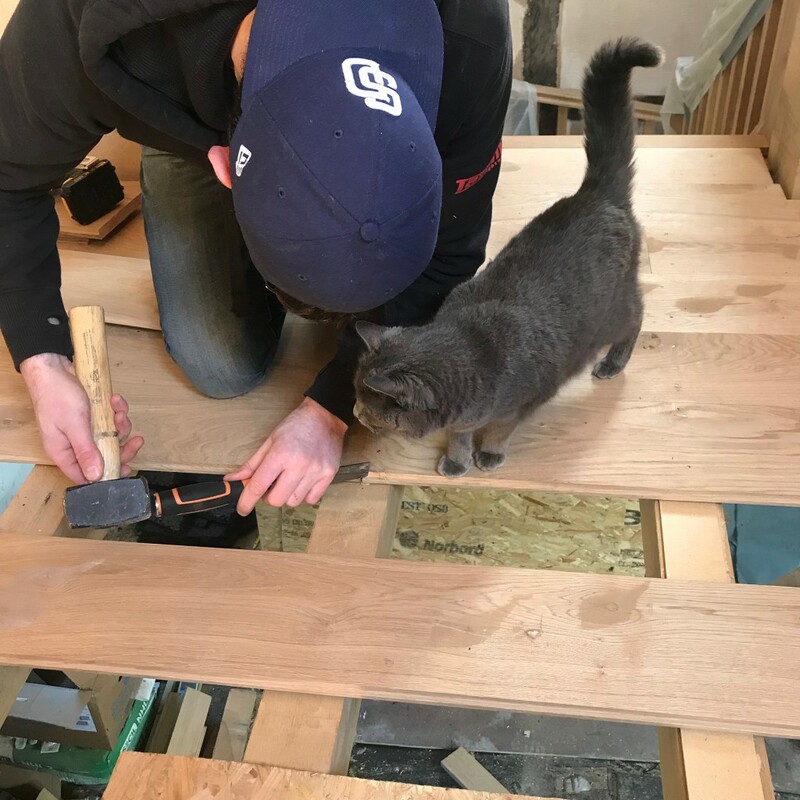 Ken is coming back after the New Year to fit the final floor joists and fix the ugly bracket, and then we can lay the floor, which we’re doing ourselves. In the meantime… it’s full electrics ahead! Exciting Times At The Dingle! The stairs are here! The stairs are here! 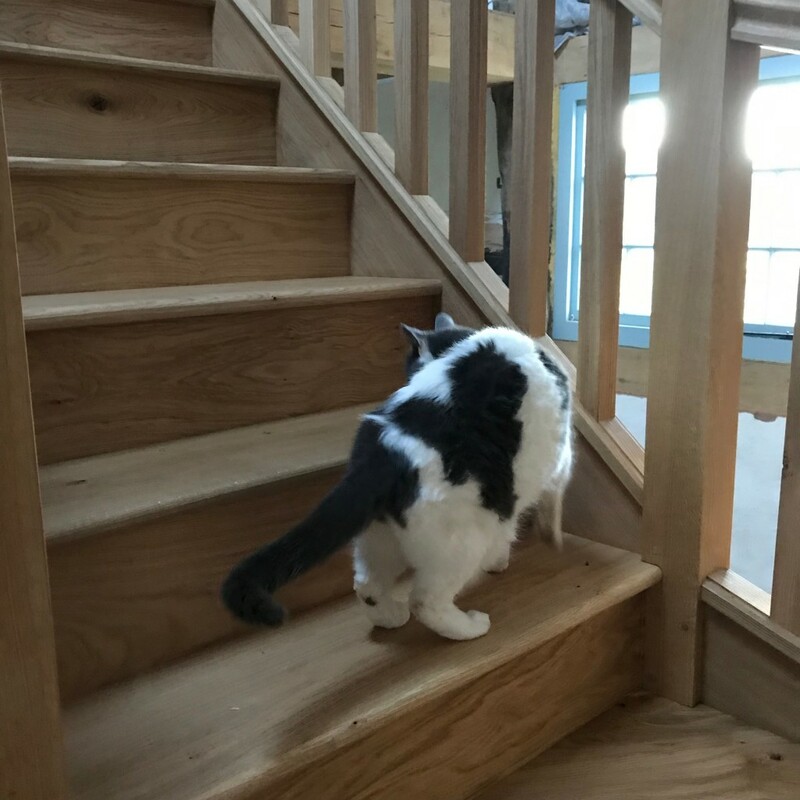 After months of waiting and delays, I am writing this with Noodle purring on my knee, listening to our new oak staircase being fitted upstairs. I am SO. EXCITED. I. MAY. EXPLODE. 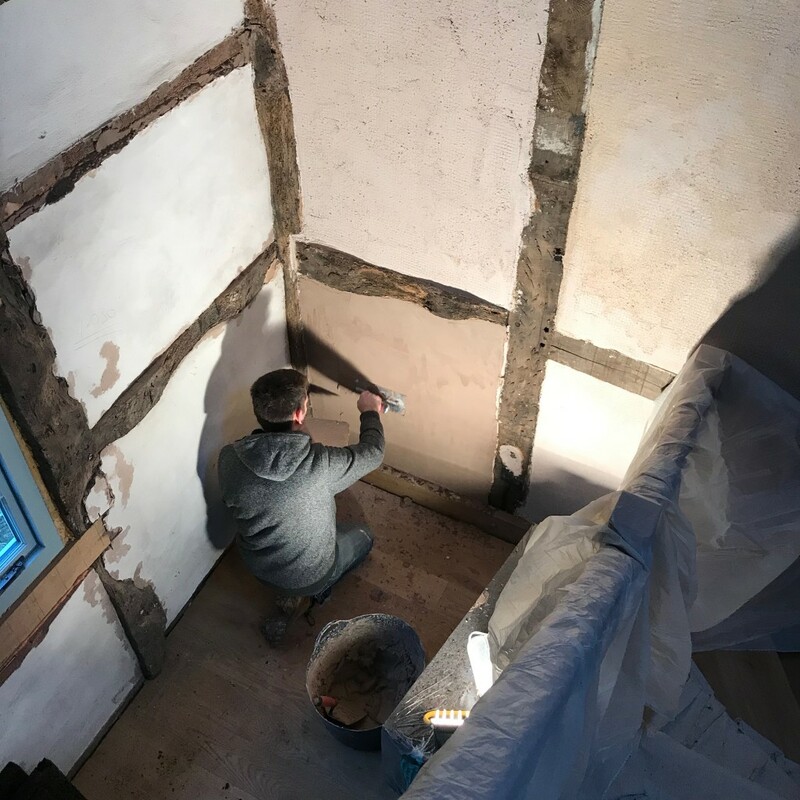 Finish the plastering onto the beams. 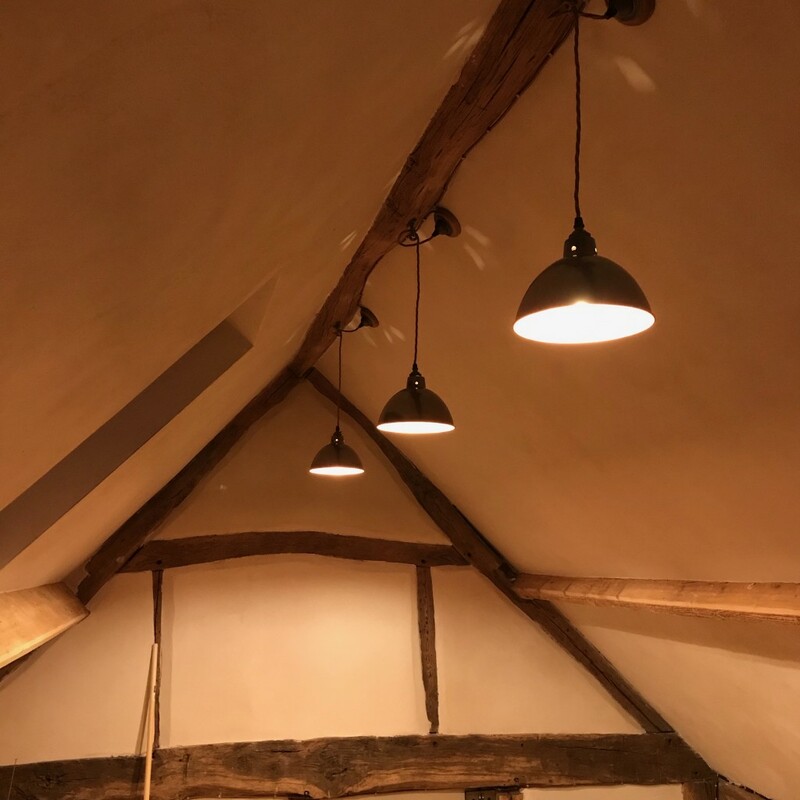 Fit electrics and beautiful lighting. Move our bed up there. Fit glass panels to the oak structure. Have a proper beautiful bedroom for the first time in nearly three years. All fitted together and ready for takeoff. 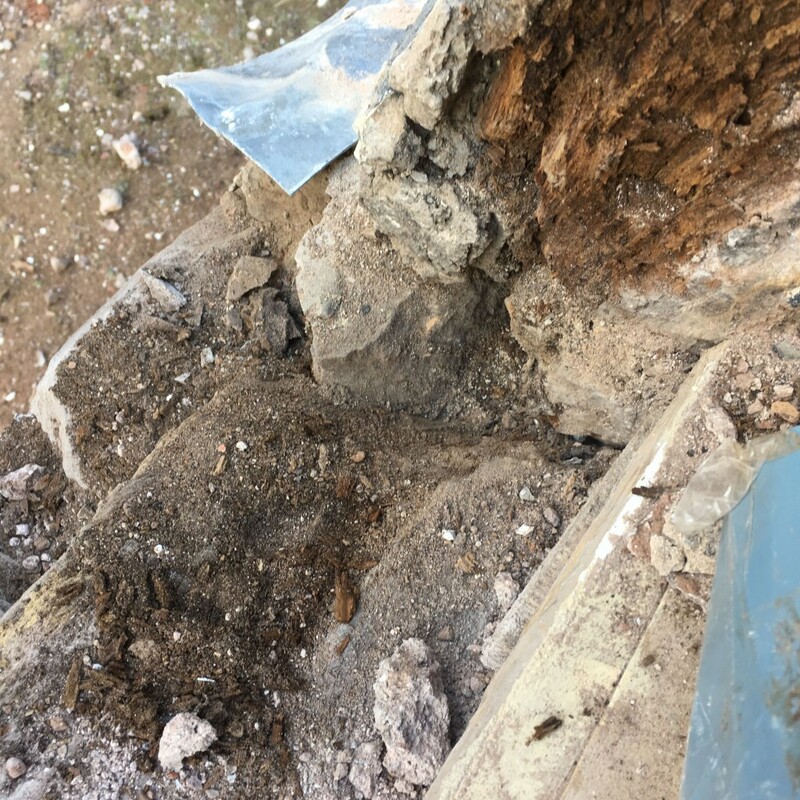 Bits of stairs, newell posts, and other assorted gubbins. Not sure what this bit is. 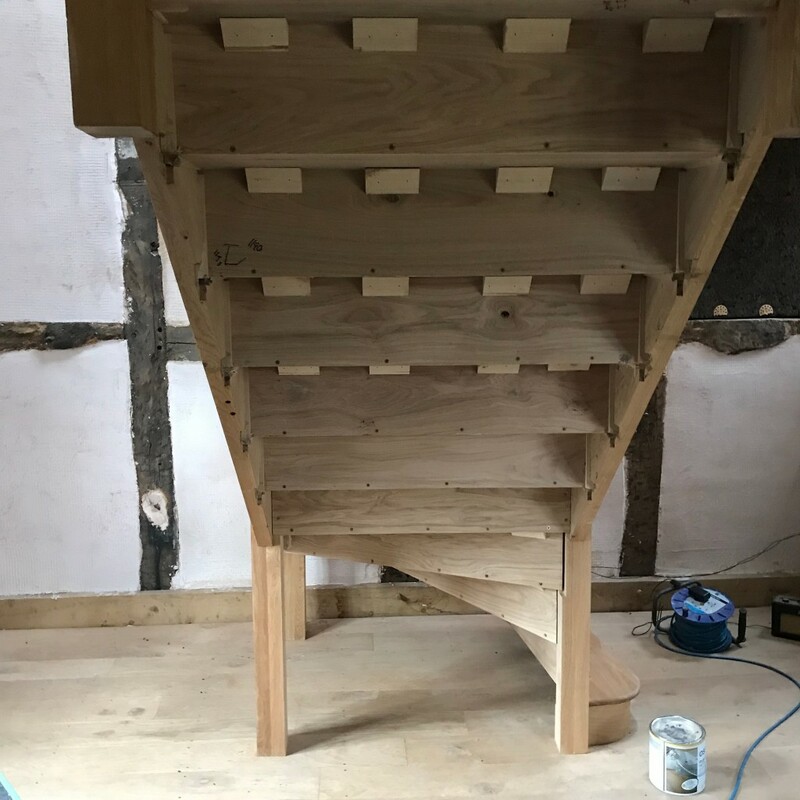 The stairs are going to go up as we enter the first floor, then turn and go straight up to the attic. 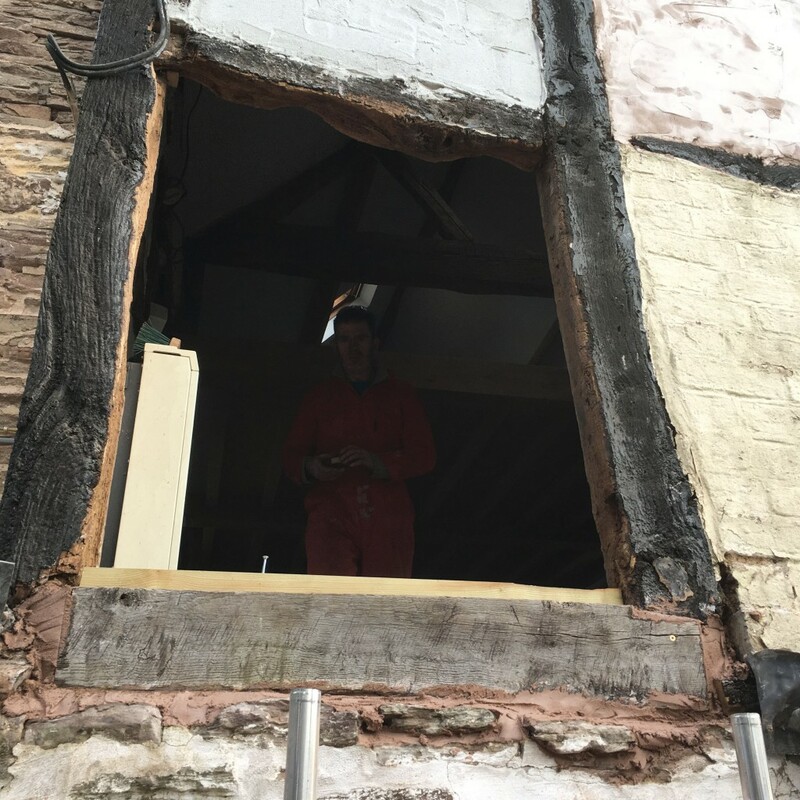 Ken the Wonder Joiner is going to chop out a big piece of oak truss (eep) to create a new doorway, then rearrange the oak props and beams so the roof doesn’t fall off. 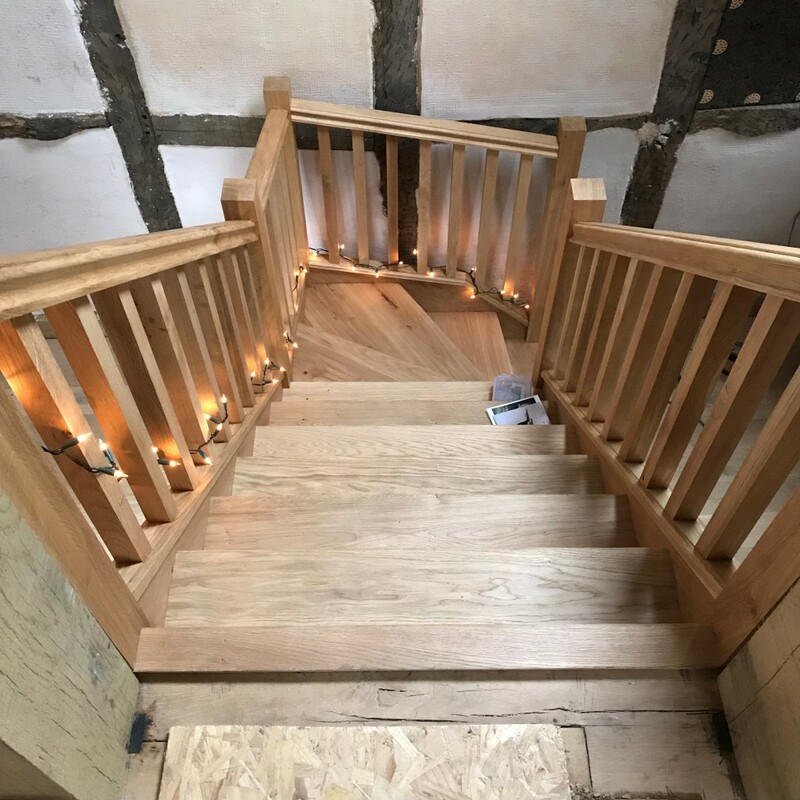 We also need a new patch of floor around where the stairs will sit, because the beautiful old oak floor you can see in the pictures above is patched where there used to be a staircase from below. We’ll do pictures when we get to that. The first course of our house is stone. 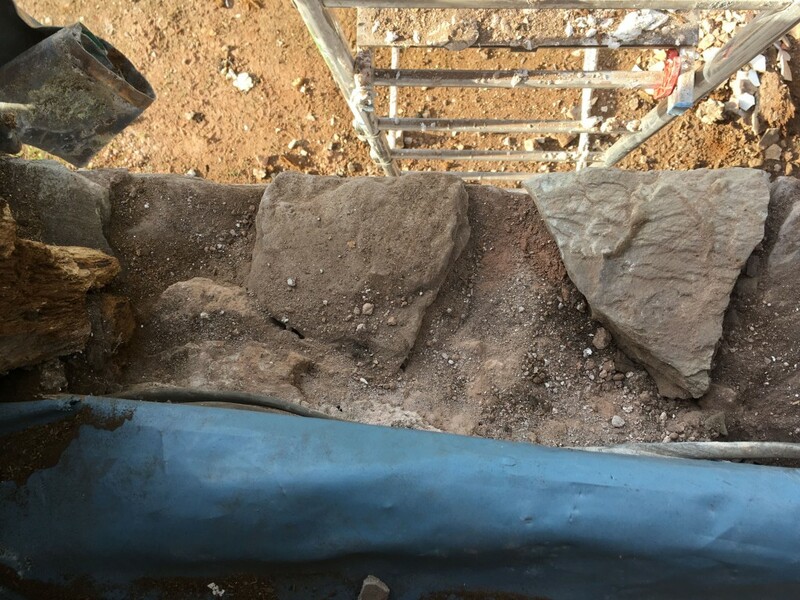 The timber-frame part sits on top of that stone. 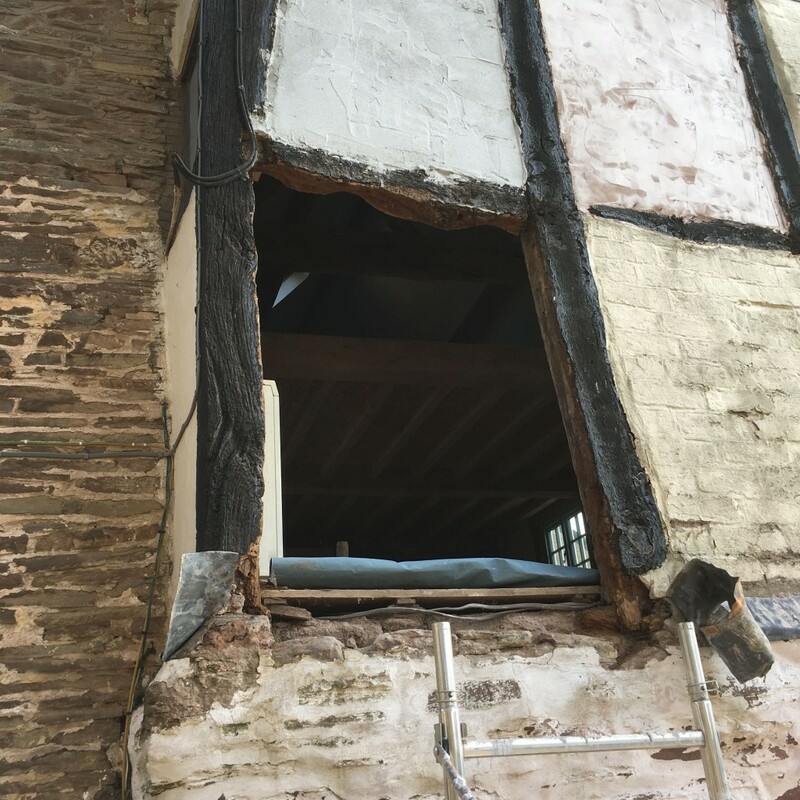 Once upon a time, there was an oak sole plate sitting on top of the stone wall – a massive long piece of timber forming the bottom of the frame. 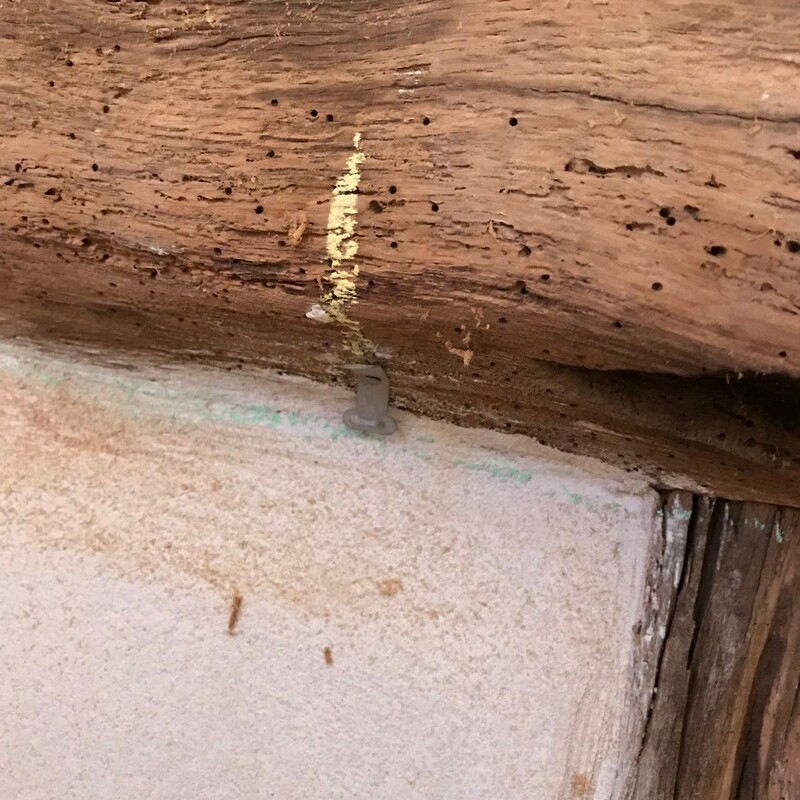 Then, someone put a concrete sill on top of that timber, fixing it to the wall. 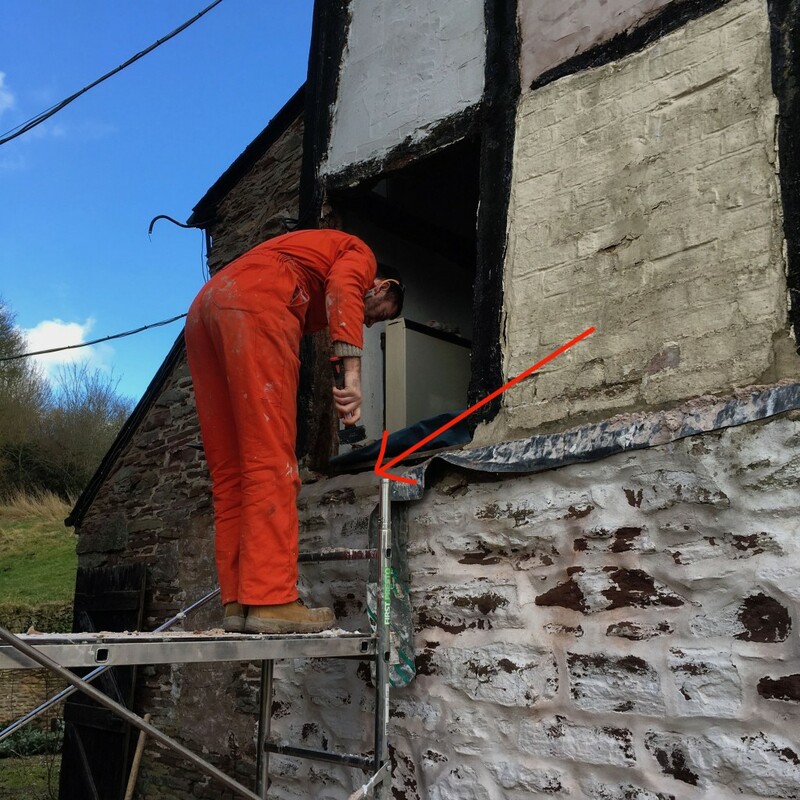 You can see it in the next photo – it was covered in lead flashing. There’s a red arrow pointing to it. The wood has crumbled to nothing next to the upright, which is pretty rotted too. Luckily, there’s still a little solid wood in there. The sole plate is dead though. We pulled it to shreds with our bare hands. 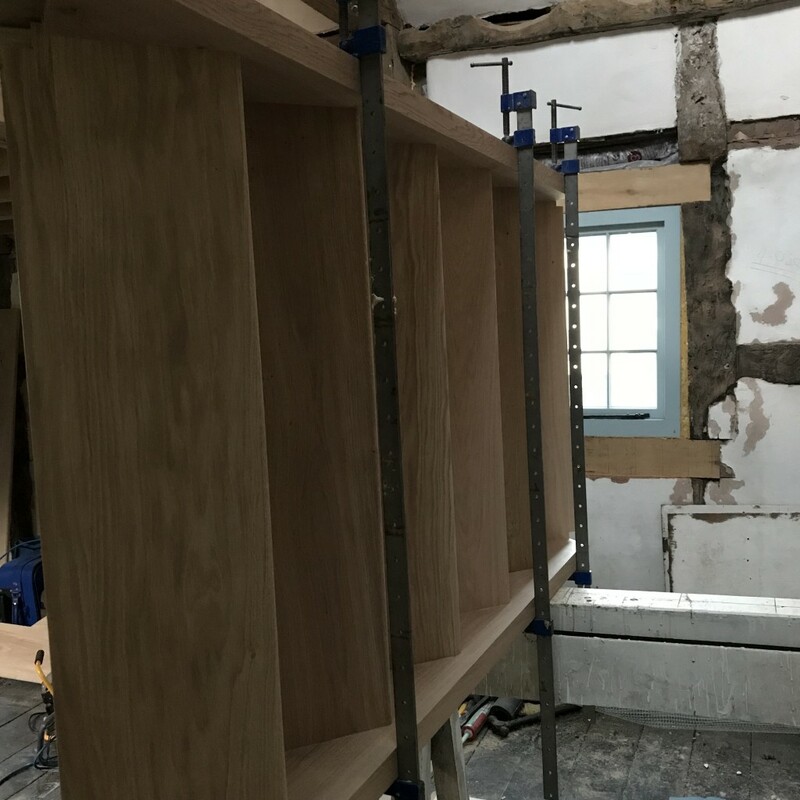 I sent a panicked text message to Ken, who is a conservation timber expert and master carpenter, and who will be doing all our oak work… but it was Saturday, so we really didn’t expect to hear from him, which is fair enough. Every time a car went by, we got all excited in case it was Ken. We really, really wanted a grownup to tell us what to do next. But in the absence of any grownups, we decided to take care of it. After all, we couldn’t really live with a 1.5m by 1m hole in the house for several days. 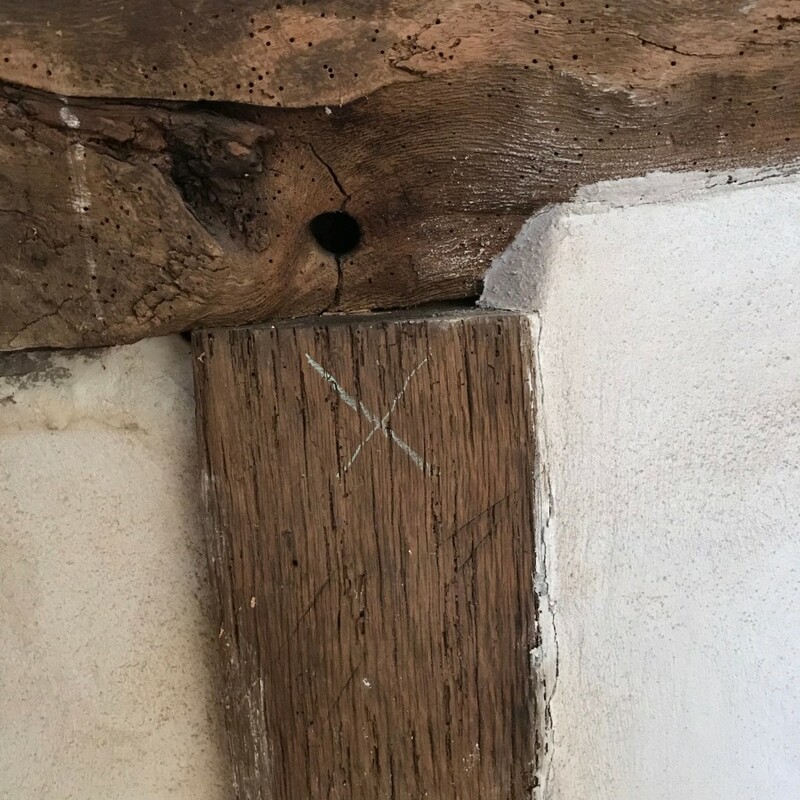 Ideally, we’d have waited and got Ken to replace the whole sole plate with a piece of timber the length of the wall, but that wasn’t an option. So we decided to do the best we could, fully expecting Ken would pull it out and do the job properly within the next few weeks. 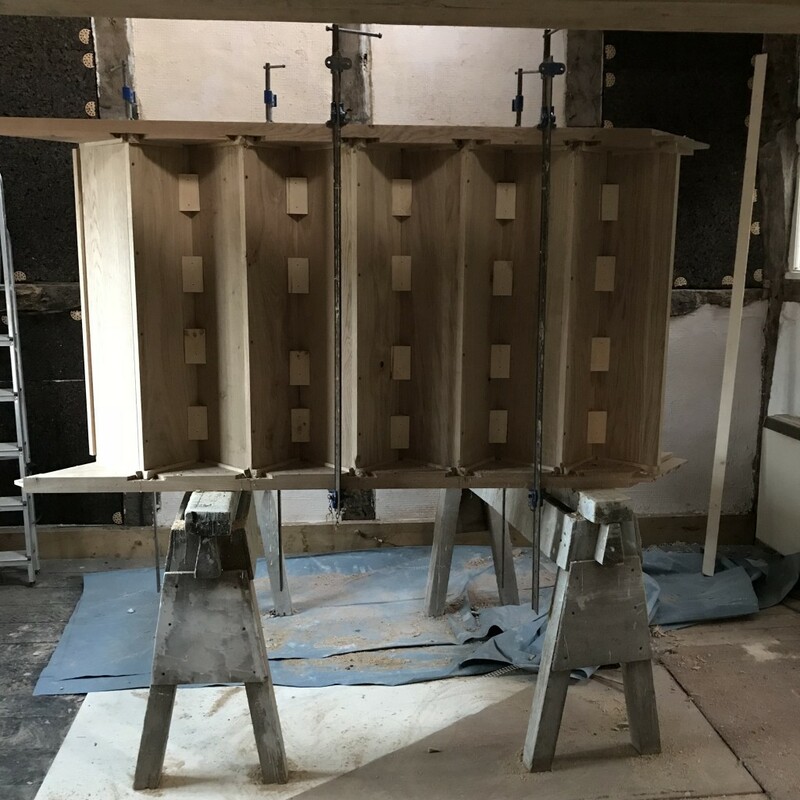 We scrambled to get the cork panels in place as before, and frankly weren’t really sure whether we’d done the right thing. 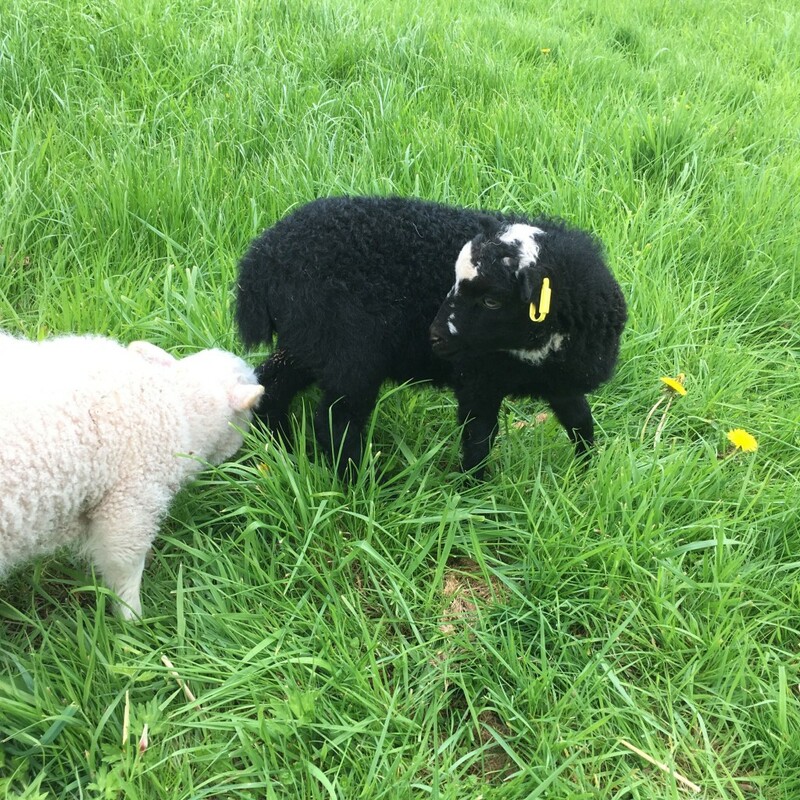 Well, Ken popped by today (Sunday) and had a quick look – and said we’d done really well. Obviously he’d have taken the whole lot out at once and replaced a whole new piece, but he said what we’ve done is perfectly adequate. He’ll make us a fake peg to hide that wood screw, then put a new timber in for the rest of the wall length. We might ask him just to do the entire length so it’s “proper”… we’ll see. Either way, we’re pretty chuffed with ourselves. And now the temperature is up again, the lime should be fine. All in all, an exciting weekend… so we celebrated with mountains of Mexican food and Black Panther at the cinema. Chin chin!